On this special Thanksgiving episode of Radio Cherry Bombe, we are skipping the turkey talk to discuss something a little sweeter: Pie. Guest host Jessie Sheehan chats everything from childhood to cream cheese with Lisa Ludwinksi, the founder, owner, and head baker of Sister Pie. After years of living in New York City, Lisa decided to take her skills back to her home in Detroit to pursue her passion for pie and sustainable business practices. 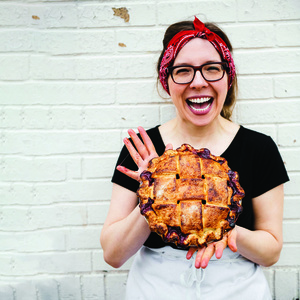 Today, Lisa runs Sister Pie, a pie shop in Detroit’s West Village that not only serves the best treats by the slice but has a triple bottom line business plan that focuses on giving back to the community. Tune in to this very special episode to learn more about Lisa’s life path and hear the two discuss some fantastic tricks for making treats at home. Plus, if you’re looking to get ahead on your holiday shopping, both bake have cookbooks out now: Jessie’s The Vintage Baker and Lisa’s Sister Pie are available where cookbooks are sold! Thank you to Le Cordon Bleu, Vital Farms Pasture Raised Eggs, and Bob’s Red Mill for supporting this episode of Radio Cherry Bombe!